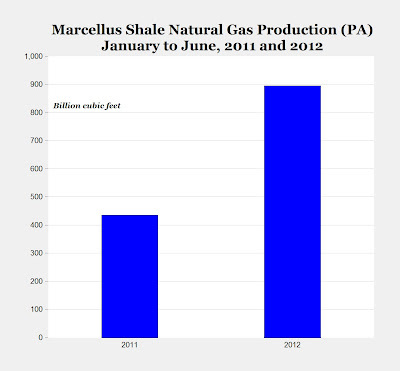 Despite low prices and a new tax on the industry, natural gas production in Pennsylvania has doubled in the past year. 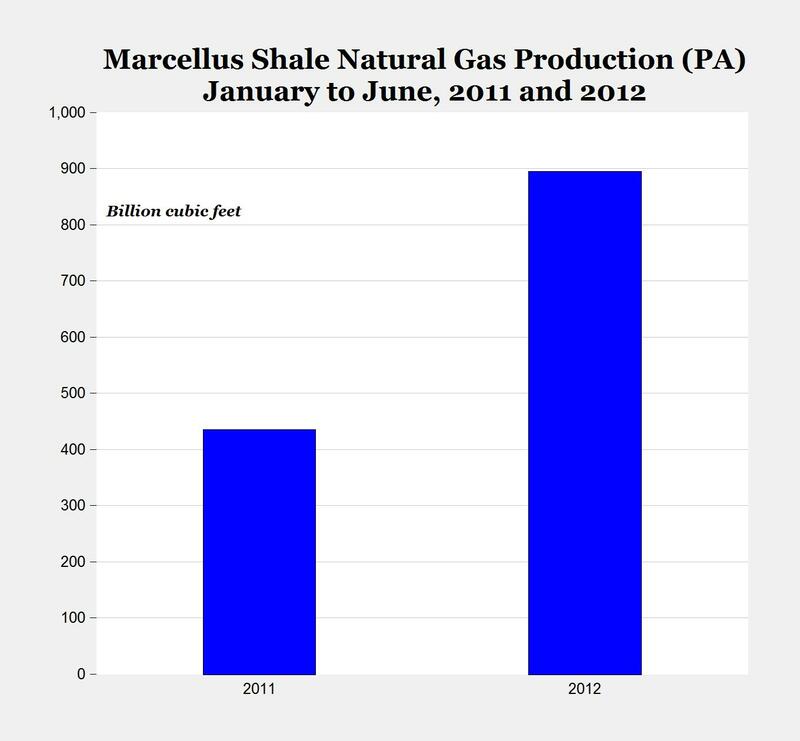 Drillers operating in Pennsylvania’s expansive Marcellus Shale gas field extracted 895 billion cubic feet of gas during the first six months of 2012, according to figures released by the state Department of Environmental Protection. That’s up from about 435 billion cubic feet during the same period in 2011 (see chart above). The data are evidence that – despite near record-low prices for natural gas that have caused some companies to slow production and the creation of a new state tax on extracting natural gas – the Marcellus Shale boom is continuing in Pennsylvania. Patrick Creighton, spokesman for the Marcellus Shale Coalition, an industry group, said the increased drilling was creating jobs, benefiting consumers with lower utility bills and helping the manufacturing sector. “These production reports are proof positive that … Marcellus Shale holds tremendous potential for decades to come,” he said. The gas drilling industry supports more than 238,000 jobs in Pennsylvania, and has seen job growth jump by 150 percent for the three years ending in 2011. Job growth across all other sectors in the state declined for the same period, according to the state Department of Labor and Industry. 2. The horizontal drilling boom has spread to Russia, where its use is predicted to grow faster than in the United States, and is already driving a boom in shale oil and gas, according to this report in The Moscow Times. Further, the article also mentions Russia's massive Bazhenov Formation, which could be the world's largest oil shale deposit ("80 times bigger than the Bakken") and is expected to be producing 1 million barrels per day by 2020. Yet Chesapeake energy, the largest independent producer of gas, has supposedly cut back dry gas production by 60%. Yet output is still going up? Russian drilling acitivity could be great news for Northern European customers of Russ Nat Gas. Economists are always wrong because they forget to look at price. The "Peak what?" overlooks world oil prices averaging $113 over the past year while world supply is a rounding error over 2006 levels. It's taken US $4 prices to keep supply flat? Um, Houston, are we not concerned? Good thing economic growth is so poor!
" Now, however, the number of rigs drilling for oil has stabilized at about 1,400, even as the gas rig count has continued to tumble." this cuts costs and less of a footprint on surface land. Yes of course, but one rig can only drill one well at a time... i.e., overall drilling is slowing. "Yes of course, but one rig can only drill one well at a time... i.e., overall drilling is slowing"
on this 45,000 acre property in Colorado, 32 wells per pad is standard, and a 50+ well pad has been also utilized as "well". This must be contributing significantly to the "stabilizing" and "tumbling" rig count. So, is drilling activity slowing, as indicated by rig counts? I don't know enough about the industry but it sure seems possible that pad drilling might be swaying statistics.